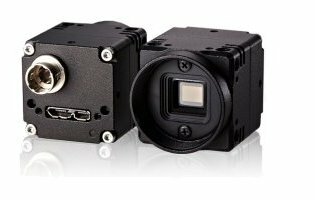 The MCA5MUSB3 color camera features a 1/2.5″ 5 MP CMOS; (Aptina: MT9P031/12STC) with a 2592 (H) x 1944 (V) pixel array capable of full frame rates of 14 Hz and partial scan frame rates up to 126 Hz. It has an ultra compact design measuring just 28mm (W) x 28mm (H) x 33mm (D) and standard C-mounting for a lens. Flexible shutter modes, exposure control and binning functions are provided as well as AOI control, horizontal or vertical line skipping, white balance, mirror image, and pixel blemish correction. SenTech USB 3.0 cameras feature Pleora drive hardware providing compatibility with a wide variety of software applications and drivers. Binning Horizontal 1/2, 1/4, Vertical 1/2, 1/4, *Only pixels in the horizontal direction can be added to increase the brightness. Optical Center Accuracy Positional Accuracy in H and V directions: +/- 0.5 mm, Rotational accuracy of H and V: +/- 0.35 deg.